So I asked all my followers on Twitter what they like most about Nicole Richie and everyone agreed that Nicole Richie is an amazing Mom, she is not only a great Mother she also manages to find time to be a talented designer, writer, actress, philanthropist and fashionista. In late 2006 Nicole Richie & rocker Joel Madden became acquaintances and by 2007 they were officially an item. 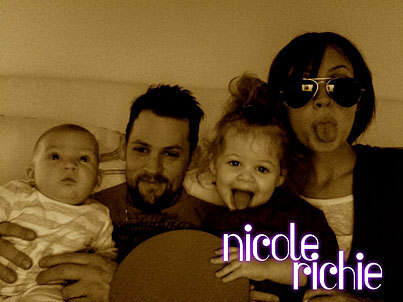 On January 11th 2008 Nicole Richie gave birth to a beautiful baby girl, Harlow Winter Kate Madden. Before the birth and also after the birth of their baby girl Nicole Richie & Joel Madden became dedicated philanthropists with their own charity The Richie Madden Children's foundation and they took time to raise the awareness of giving all children a happy and safe life. Whilst bringing up their first child and raising money and awareness for their charity Nicole also had time to develop and debut her jewellery collection House of Harlow 1960. In the year of 2008 Nicole Richie also made a cameo on the hit TV show Chuck. In the year of 2009 Nicole Richie announced she was pregnant with her second child. She also worked with 'A Pea In The Pod' and released her first maternity collection. On September 9th 2009 Nicole Richie gave birth to her second child, a cute baby boy Sparrow James Midnight Maddden. Whilst raising her two beautiful babies Nicole began to extend her fashion empire and she was busy designing apparel for her Winter Kate clothing line and footwear for her House of Harlow collection. Into 2010 Nicole Richie released her Winter Kate collection, it received an outstanding reception and Nicole was even awarded with 'Entrepreneur of the year' in the 2010 Glamour Awards. Nicole has now announced the release of her second novel Priceless and she is also busy developing her fashion empire which is soon extending into handbags. Nicole Richie truly is a hardworking Mommy! aww I love the photos you used soo much!